By almost every measure, the US economy is booming. But a look behind the headlines of roaring job growth and consumer spending reveals how the boom continues in large part by the poorer half of Americans draining their savings and piling up debt. 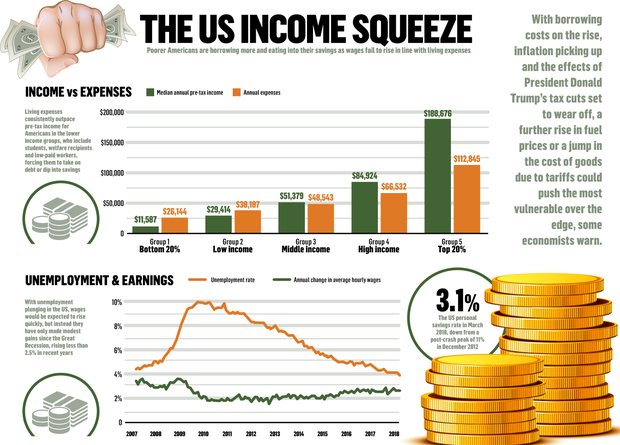 A Reuters analysis of US household data shows the bottom 60pc of income-earners have accounted for most of the rise in spending over the past two years even as their finances worsened – a break with a decades-old trend where the better off fuelled consumption growth. With borrowing costs on the rise, inflation picking up and the effects of President Donald Trump’s tax cuts set to wear off, a further rise in fuel prices or a jump in the cost of goods due to tariffs could push those most vulnerable over the edge, some economists warn. That in turn could threaten the second-longest US expansion given consumption makes up 70pc of the US economy’s output. In fact, a growing majority of Americans says they are comfortable financially. Yet by filtering data on household finances and wages by income brackets, the Reuters analysis reveals growing financial stress among lower-income households even as their contribution to consumption and the broad economy grows. The data shows the rise in median expenditures has outpaced before-tax income for the lower 40pc of earners in the five years to mid-2017 while the upper half has increased its financial cushion, deepening income disparities. It is this recovery’s paradox. A hot job market and other signs of economic health encourage rich and poor alike to spend more, but tepid wage growth for many middle-class and low-income Americans means they need to dip into their savings and borrow more to do that. Over the past year signs of financial fragility have been multiplying, with credit card and car loan delinquencies on the rise and savings at their lowest since 2005. Myna Whitney (27), a certified medical assistant at Drexel University’s gastroenterology unit in Philadelphia, experienced that first-hand. Three years ago, confident that a steady full-time job offered enough financial security, she took out loans to buy a Honda Odyssey and a $119,000 (€102,000) house. Since then she has learned that making $16.47 an hour – more than about 40pc of US workers – was not enough. “I was dipping into my savings account every month to just make all of the payments.” With her savings now down to $900 from $10,000, she budgets down to toilet paper and electricity. Cable TV and the occasional $5 Groupon movie outings are her indulgences, she says. “They are taking on debt they can’t repay. A drop in savings and rise in delinquencies means you can’t support the (overall) spending.” An oil or trade shock could lead to “a rather dramatic scaling back of consumption,” he added.